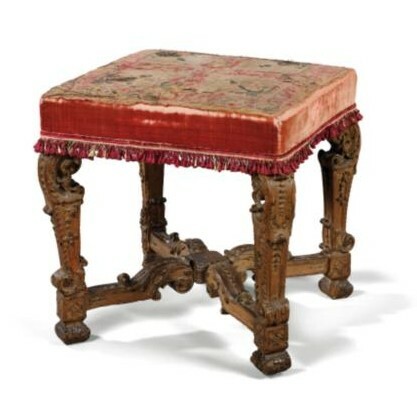 The stool is simple in invoices and followed the styles and ornamentation of his time. The stool appears at the end of the Middle Ages. Originally, it differs from the rectangular petition by its circular shape, which give it its name. Indeed the term “stool” comes from the term “tabur” which refers to the time an instrument circular drum. This siege took over time many forms. For practical reasons, it was sometimes placed in the corner of the room. This stool said “In corner” then has a right angle. The cabinet has sometimes been perfected to the extreme. Napoleon had in his large library filled with leather stools can unfold to form a ladder. The term stool may designate the person who has the right to sit there. “Sir said the princess to kiss people she had, that is to say, blood princes and princesses, dukes and duchesses and other stools” (Extract from the memoirs of the Duc de Saint-Simon (1675-1755) ). It should be recalled that under the Old Regime everyone’s Environment king or queen could not sit on it. The stool is a seat reserved for an elite. Under Louis XIV, the seat that is given to princesses or duchesses to the queen.